Happy Earth Day! Since 1970, April 22nd has been recognized as Earth Day, meant to inspire awareness and appreciation for the Earth's environment. It is now recognized as an international event in over 170 countries. If you are in Canada, check out Earth Day events in your area on the Earth Day Canada site. I have been making different kinds of recycled books lately. I save a lot of boxes from food packaging because some of them have fun pictures and designs and sometimes I'll get a box that is an interesting shape... I save a lot of stuff, can you imagine how my little bookbinding studio must look with all this stuff in there? the room is very crowded... And if I'm going to save it then I also need to use it for something! So I just made a bunch of small notebooks using these saved boxes - two different styles. Some fan notebooks, bound with a single screw post in the corner. And a few stab-bound notebooks where most of the pages are box tops and side panels so the end that is sewn had a pre-existing crease. This gives all the pages a decent hinge allowing the notebook to open quite well. You can also use boxes to make mailers, i.e. sturdy envelopes. This is particularly useful for people like me who sell stuff online and always have to find/buy shipping materials. 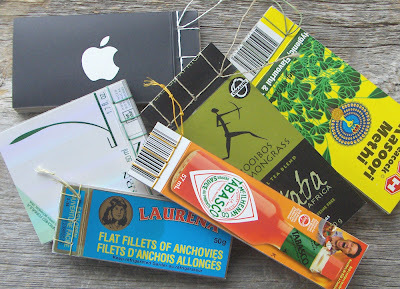 If you want to see how it's easily done, there is a quick tutorial for making a granola box mailer on the TCET blog. Nice recycled books, and thanks for the mailer tutorial. So simple, so effective, so useful. I really like the cardboard mailer too - I've done similar mailers with the printed side out, then attached a label on it. But I suppose the postal workers probably prefer them inside-out!